Article by: Nancy M. Cappello, Ph.D. I felt betrayed by my health-care providers and the medical establishment when, after 11 years of normal mammogram results, I was diagnosed with an advanced stage breast cancer which had metastasized to 13 lymph nodes. My extremely dense breast tissue was only disclosed to me after I questioned my new team of doctors as to why my invasive cancer was at a late-stage. Each of them reported to me, in a surprisingly nonchalant manner, that my extremely dense tissue prevented my mammograms from ‘seeing’ my cancer. I was stunned that this condition of having dense breast tissue, which limited the ability of the mammogram to see cancer, was never disclosed to me until aftermy late stage diagnosis. I also discovered that I was not alone as 40% of women have dense breast tissue and that decades of science conclude that having dense breast tissue is also a risk factor for breast cancer. It was a profound and startling discovery that, despite never missing my annual mammogram, my breast health was hugely compromised because of my dense breast tissue, which yielded a greater likelihood of dying from this disease. I also discovered that screening tests beyond the mammogram are not limited in detecting cancers in the dense breast. Armed with this new-found and potentially life-saving knowledge, and outraged that my doctors refused to report dense breast tissue as part of a patient’s mammography reporting results, my husband Joe and I sought breast cancer screening justice through legislation. We wanted women with dense breast tissue to have an opportunity to discuss with health-care providers their dense breast tissue and other risk factors to determine their personalized screening surveillance. In 2009, even with past overt opposition from the Society of Radiologists and other physician-trade organizations, Connecticut became the first state in the nation to disclose dense tissue to patients through the mammography reporting results. As of this publication, 35 states have followed Connecticut’s breast health leadership with a density reporting law. In 2012, California became the 5thstate to pass a breast density reporting law which became effective on April 1, 2013. The law required facilities who perform mammography exams to include in the patients’ mammogram results letter a finding of dense breast tissue to those whose mammogram shows dense breast tissue. As part of the bill’s language negotiations, an expiration date of January 1, 2019 was added which would sunset the law on that date. Senate Bill 1034, introduced by Senator Holly Mitchell this legislative session would eliminate the sunset clause and the law would remain in place. 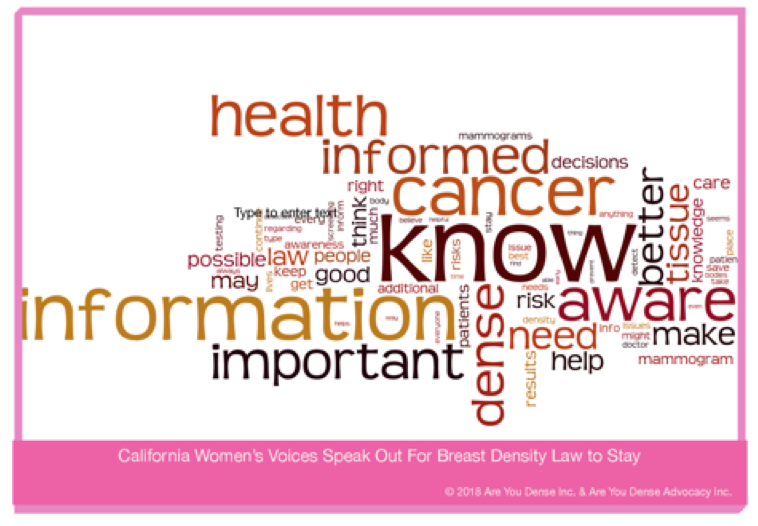 Concerned about past opposition to the California breast density reporting bill and a Governor’s veto in 2011, we needed to hear from the voices of women who have the most to gain or lose from their stage at diagnosis. Their voices needed to be front and center as the merits of the breast density law are debated. The two non-profits that I founded, Are Your Dense, Inc. and Are You Dense Advocacy, Inc. commissioned Spectrum Associates to determine California women’s awareness of the issue of dense breast tissue and law’s impact. An online survey through Research Now was distributed to 500 California women, between the ages of 40 and 74 years old who had a mammogram within the past two years. The surveys were completed March 22-27, 2018. The racial/ethnic representation within the study sample was reflective of the state’s population. 95% of respondents want the breast density reporting law to remain. 85% of respondents agreed that it is important that every woman knew her type of breast tissue and 88% agreed that they would prefer to know than not know. 68% of California women learned of their breast tissue type from a conversation with health care providers. 59% of the respondents who had dense breasts indicated that their health care provider had talked to them about having additional screening. California women’s voices are loud and clear for the law to stay in place leading to conversations between patient and provider about personalized screening, an opportunity I never had. Nancy M. Cappello, Ph.D. is Director and Founder of Are You Dense, Inc., and Are You Dense Advocacy, Inc., with a mission to educate the public about the risks and screening challenges of dense breast tissue to prevent missed, delayed, and advanced-stage cancer, thus reducing mortality. She is the inspiration behind Connecticut’s first-in-the-nation density reporting law passed in 2009, making the state a global leader in density reporting, adjunct screening, and the density reporting grassroots movement.